Why might my dog behave aggressively toward me? There are multiple reasons that a dog may exhibit aggression toward family members. The most common causes include conflict aggression, fear-based or defensive aggression, possessive aggression, food guarding aggression and redirected aggression. Fear-based, possessive and redirected aggressions are discussed in other handouts in this series. This handout will discuss aggression directed toward family members that has a social status motivation. In social status aggression the behavior is in response to the perceived relationship between the dog and the individual with whom he is interacting at the time. Social status aggression in dogs has been called dominance aggression, status related aggression and conflict aggression, but is likely related to conflict (competing motivations) or uncertainty about what is the appropriate way (from the owner's standpoint) to react in the situation. What does "dominance hierarchy" mean? The concept of dominance hierarchy is used when describing social relationships within groups of animals. Animals that live in groups do so because of the advantages of group living. These include cooperative raising of the young, ease of obtaining food and defense against predators. Since group members offer benefits to each other, it is counter-productive to fight among members and risk injury. Therefore, communication and an understanding of how to share resources are essential. Resources are usually allocated to the strongest members first. Those at the top get things such as food, resting-places, mates and favored possessions preferentially over lower ranking individuals. This has been termed "dominance" hierarchy. The rank of an individual is determined by such factors as genetics, which individual was first on the territory, age, results of competitive encounters, and the competition for resources. "Dominance is the quality of a relationship, not of an individual." In an encounter where one animal acts "dominant" there needs to be another who acts subordinate and deferential or fighting will occur. Subordinate, submissive or deferential behaviors in dogs include looking away, or lowered head, body, tail and ears. Crouching down or rolling over and exposing the abdomen are both shows of extreme submission. Note that a dominance or pack hierarchy will develop in a group of dogs, but that dominance or leadership refers to the relative relationship of two individuals. Dominance is the quality of a relationship, not of an individual; an individual who is dominant in one relationship may be subordinate in another. An alternate view suggests that hierarchies are maintained by the deference of individuals, not by dominant actions. Either way, an outright aggressive encounter with injury to one or both parties is rare; in functioning hierarchies, disputes are usually settled with threats and deference. How does this apply to dogs in human households? Dogs have evolved from wolves, which live in social groups, so that the domestic dog is evolutionarily prepared to live in a group. Of course, with domestication and selective breeding there is wide variation in physical characteristics and behavioral types when comparing breeds to breeds and dogs to wolves (or to each other). When factoring in the effects of early handling and socialization with people during the sensitive period, the concept of the wild dog or wolf hierarchy may not entirely apply to domestic canines. For aggression between dogs in the household, please see our handout on 'Aggression in Dogs – Sibling Rivalry'. "The dog will need to "learn" how to communicate with this new species." When a dog is adopted into a human household, its new social group will consist of the people and other pets in the home. The dog will need to "learn" how to communicate with this new species (humans) using its canine repertoire of body postures, expressions, actions and vocalization. Communication between dogs and humans is related to how we act and interact with our pets (mood, attitude, consequences) and is less a function of our body postures, facial expressions and vocalization. While dogs generally form a hierarchy with members of their own species, their relationship with humans will at most, be only loosely based on this pack structure. How each individual dog functions within the family group will be influenced by its genetics, early experiences and environment. Human leadership and control must be achieved through actions, training and handling that teach the dog to exhibit appropriate responses and defer to the family members in order to receive rewards. 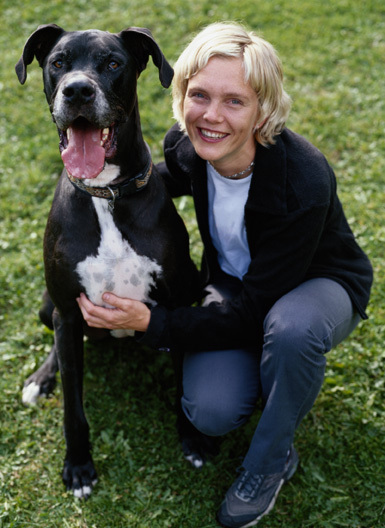 A leadership program for dogs teaches the dog: that rewards are earned for compliance and obedience; that handling and restraint on the part of family members are to be enjoyed and tolerated; that rewards cannot be obtained on demand; and that there is a regular daily routine of exercise, play, feeding and training that is scheduled and initiated by family members. For details, see our handouts on 'Training Dogs – Learn to Earn and Predictable Rewards' and on 'Puppy – Handling and Food Bowl Exercises'. When a dog has free access to favored resources or can obtain them on demand (food, resting places, and owner attention) the dog may assume it can take control or even become possessive of these resources. In addition, these resources can no longer be used effectively for training unless they are reserved for reinforcement of desirable behaviors. Confrontational techniques and those that use physical restraint and handling to gain control should be avoided as they may lead to defensive and fearful responses. The outcome of reward based training and handling exercises should be a dog that enjoys and/or defers to human restraint and handling without fear or aggression. Dogs can respond with aggression if they feel they are challenged for control over resources. When the family members control access to these resources, they can be used to shape and reinforce desirable responses and their motivational value is maintained. Dogs that do not have their resources controlled by their owners may be more possessive, protective, and anxious than dogs that have the "comfort" of knowing when, where and how rewards can be obtained. With a family member in control, the dog is likely to be more calm and responsive when meeting and greeting new stimuli, rather than having the uncertainty and anxiety of being leader and protector of the group. In addition, the inconsistent use of rewards and punishment further increases the pet's anxiety, which can lead to aggressive responses in certain situations. Conflict induced aggression is a term that is frequently used to describe what was previously known as dominance aggression, a term that is overused and may be an inaccurate diagnosis for why the dog is behaving aggressively toward family members. It is important not only to recognize all situations in which aggression might arise, but also why and how the aggression has developed in order to determine the prognosis (the possibility for safe and effective improvement) and to design an appropriate treatment plan. Aggression toward family members may be due to: fear and anxiety; conflict (i.e. uncertainty or unpredictability as to how the human might respond); defensive responses (as when the pet perceives that it might be punished); possessive behavior (resource holding potential), redirected aggression; or dominance aggression, which may in fact, be a combination of learned or conflict induced responses or related to impulse control disorders. Assessing the history with respect to the early encounters may help determine underlying motivation even when circumstances or body postures have changed over time. "One situation in which conflict arises is when family members sometimes give in to the puppy's demands and at other times punish the puppy for the very same behaviors." Puppies that control owner interactions with play biting, barking or attention soliciting will quickly learn that these are effective behaviors to achieve what they want; conversely they do not learn that the owners control rewards nor do they learn that deferential, obedient or settled behaviors are how to achieve rewards. This type of assertive and demanding behavior might eventually escalate into increasingly pushy and even aggressive behavior as the puppy learns that this is a successful means of gaining control of resources. Another concern is the conflict (competing motivations) that arises when dogs interact with owners through the inconsistent and unpredictable use of rewards and punishment. One situation in which conflict arises is when family members sometimes give in to the puppy's demands and at other times punish the puppy for the very same behaviors. Another common inconsistency is when the owners use positive reinforcement (rewards) to get desirable behavior and then use varying intensities of punishment when the pet does not respond (e.g. hitting, leash corrections, prong collars). In fact, physical punishment of any type may lead to conflict or defensive aggression either at the time or when you attempt to handle your dog in future interactions. Some dogs may aggressively challenge their owners to maintain a favored resource (e.g. sleeping area, toy, or attention of a family member)(see our handout on 'Aggression in Dogs – Possessive, Toy Guarding'). The problem may be further aggravated by the owner's reaction (e.g. withdrawal, which may be prudent if the dog is threatening aggressively, reinforces the behavior) because over time the dog learns that aggressive behavior results in a successful outcome. Confrontation, punishment, threats or owner fear and anxiety are only likely to make the dog more defensive and anxious over further similar confrontations. that you gain control of your dog." In each of these examples, conflict, fear, possessiveness, or learning, rather than dominance, is the cause of the aggression. However, genetic factors also play an important role in how assertive, pushy, and persistent a dog may act. This may be displayed the situations such as where an owner attempts to approach or pet the dog when it is resting or not interested (not in the mood) for social interaction. At these times, rather benign challenges by family members such as trying to pass by, move, sit beside, lie down beside, pet or hug the dog might lead to threats and aggression. While it is possible that the aggression is learned, defensive or conflict induced, a dominance or status related diagnosis is also possible. Regardless of the cause, the treatment program requires that you gain control of your dog through the use of proper and consistent application of rewards, physical control devices, cessation of all punishment, and regaining control of resources and reinforcers so that you can teach your dog what is desirable. In some cases, the aggressive displays are so intense and out of proportion to the challenge that excessive anxiety or a lack of impulse control may be a component of the problem (in which case drugs might be considered). How can I gain effective control of my dog? It is important that family members set themselves up as leaders very early in their relationship with their dog. Becoming the leader does not imply harshness or punishment, but control of resources and behavior. This is accomplished with reward based training, physical control devices and supervision. The individual temperament and genetic predisposition of the puppy will determine the methods needed by the owner to become the leader, since some puppies are more assertive, excitable, fearful, easily distracted or difficult to motivate and therefore more difficult to train. Ask for our handouts on 'Puppy – Training Basics', 'Aggression in Dogs – Overview and Diagnosis', 'Behavior Management Products' and 'Training Dogs – Learn to Earn and Predictable Rewards' as well as handouts on how to train specific commands. It is equally important to recognize deference when it occurs. When your dog looks away, lowers its head or avoids you, especially when you are reprimanding it, this is deference. From the dog's perspective, the encounter is over and if the human persists with reprimands or punishment, the dog may respond with fear and defensive behaviors. Remember, just because the dog defers once does not mean he will in another setting. Each context is separate and the dogs' desire for the resource in question figures into the response. How can I determine if conflict / social status aggression is developing? "Early signs of social status or conflict aggression are usually subtle." Early signs of social status or conflict aggression are usually subtle. Dogs mostly use facial expressions and body postures to signal intent. A low body and wagging tail show friendly approach; a high wagging tail, eye contact and perhaps teeth showing could be an assertive approach. Challenges between family members and the pet usually begin with prolonged eye contact and maybe growling and/or snarling (lifting of the lip to expose the teeth, usually without noise) over resources such as food, resting places, moving the dog and perhaps handling the body. If the owner sometimes acquiesces but at other times continues the "challenge", the relationship may be unclear. This can create anxiety for the dog and things may escalate to snapping, lunging and biting. It will be necessary to determine the context of the aggression such as certain types of petting or handling, approaching when the dog is resting or sleeping, touching the food or toys, discipline or scolding the dog, ability to handle the body, or stepping over the dog. These aggressive displays may not occur in every situation, only those where the dog feels that its authority is being challenged, when it is not in the mood for social interactions or if it fearful and/or defensive. The body posture of the dog during the encounter is very important. Confident dogs will usually have eye contact, may be "stiff", or tense and standing tall with their tail usually up. But remember, these confident dogs are uncommon. Fearful dogs can show aggression in the same contexts as confidently aggressive dogs, but their body posture will be more consistent with fear and would include lowered head and body, tail tucked and perhaps averted eyes. It is also possible to have multiple motivations. In fact, as mentioned, many dogs show aggression when they have some degree of fear and anxiety and are uncertain or are in a state of conflict; thus they might be best termed conflict or perhaps status related aggression. Not all of these dogs behave the same and a description of what the dog looks like, how they responded to challenges, and where and with whom they occur are important pieces of information to obtain before making a diagnosis. A dog may only show aggression in limited contexts, say food guarding only, in which case the diagnosis is not dominant aggression, but guarding a highly favored resource; in this case, treatment should be focused on the possessive aggression (See our handout on 'Aggression in Dogs – Possessive, Toy Guarding'). Within a family, a dog may show conflict or may challenge some family members while avoiding or deferring to others. How the dog behaved during the initial aggressive episodes is likely a better indicator of cause, since with each aggressive event, the dog learns new ways of behaving in that situation or with that person. It is possible for a dog to growl at family members because of fear and, if the person backs away, the pet learns that aggression works. Over time, with repetition of the same scenario the dog learns that aggression results in a favorable outcome. This may result in a dog that acts confident rather than fearful, but underlying anxiety and fear may be the cause of the aggression. This would result in a different diagnosis; rather than social status aggression, this dog may be exhibiting fear or conflict aggression. What should I do if I believe that my dog is displaying conflict motivated or social status aggression? "All aggressive challenges should be taken seriously." All aggressive challenges should be taken seriously. Dogs are capable of hurting and inflicting a great deal of damage with their bites. Physically confronting a dog that is acting in an aggressive manner can result in the escalation of the aggression and subsequent injury to humans. When dogs growl, snarl or snap they are showing their intention to use aggression if the stimulus does not retreat and they may escalate their challenge. Therefore, it is important to be able to accurately determine how the dog will behave. All aggressive and potentially aggressive situations should be identified and avoided. The situations and responses are not always predictable. At no time should family members attempt to "out muscle" the dog and force it to obey. This can result in serious human injury. All physical reprimands and punishments must be stopped since they cause fear, anxiety and pain and are very likely to increase rather than decrease aggressive responses. First, identify all situations that might lead to aggression and prevent access to these circumstances (by caging or confinement, muzzle, or environmental manipulation) or otherwise control the dog when a confrontational situation might arise (e.g., leash and head halter control, tie down). Although the long-term goal would be to reduce or eliminate the potential for aggression in these situations, each new episode could lead to injury and further aggravation of the problem. A head collar and leash is a good way to control the dog inside the home, while a muzzle may be even more effective at preventing bites. 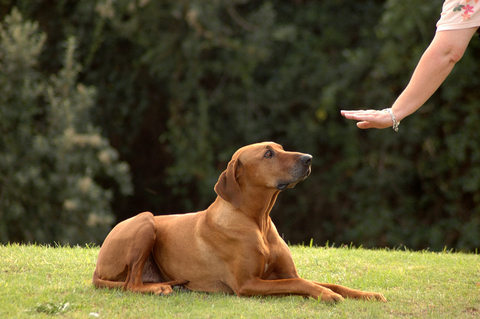 Second, identify and work to correct those situations where the dog is asserting its control but is NOT aggressive. Dogs should not be allowed into areas or onto furniture where they might be possessive, protective or unwilling to obey. It might be best to have a mat or crate where the dog can be left alone when it is resting, sleeping or chewing on its favored toys. When not confined away from potential harm, your dog should be under constant supervision. During training, and when giving commands, insure that your dog always obeys, and reward compliance immediately. Leaving a leash and head halter attached can help to insure safety and success. Mouthing, play biting and tug of war games should be avoided. While they might not increase aggression, they do allow the dog to learn how to use its mouth to control outcomes. Third, withdraw all privileges and rewards. Cease all casual interactions. Take control of all resources (i.e. treats, attention, and toys) that can be used to reward desirable behavior. Make a short list of target behaviors where the dog is calm and deferent and insist on these behaviors before every reward is given (learn to earn). When rewards are given on demand, the dog is reinforced for its actions and is in control of when and where the rewards are given. In addition, by providing attention whenever and wherever your dog wants, it may be less tolerant or become aggressive when you wish to handle, approach or give attention. Therefore, if a dog seeks any form of attention, affection, play, or food, the dog must be ignored so that it cannot achieve control over these resources. Alternatively, the dog can be taught to settle and relax before receiving rewards. In this way, calm, obedient and deferential interactions are reinforced while anxious, excitable, pushy, mouthy, and attention-seeking behaviors are not. Note that it is the attention seeking behavior that is ignored and not the dog itself. Rewards are most motivating when they have been withheld. In addition, instead of a few short training sessions each day, you can continuously insure that you respond consistently by having your dog exhibit appropriate behaviors or defer to you every time you would normally give a reward. Some dogs, especially at first may not respond to your command to settle when asked. If they do not obey, you have two options; one would be to ignore your dog or walk away until it is settle. The second would be to find a way to insure that your dog succeeds, either by using lure training or by leaving a leash and head halter attached. Your dog should learn quickly if you focus on training what behaviors will achieve rewards, and by withdrawing social interaction for undesirable behavior. Fourth, reward-based obedience training is essential so that you can quickly and effectively communicate with your dog to get desirable responses rather than punishing undesirable ones. Begin in safe and controlled environments with rewards given for compliance. Work to achieve "come" and "settled" responses (sit/focus, down-settle, go to your mat) on cue (see our handout on 'Training Dogs - Settle and Relaxation Training'). Once successful, these commands should be practiced in a variety of environments and with all family members. Again, use a leash and head halter to ensure success, while controlling the head and mouth. Clicker training can also be a positive and immediate way to shape desirable behavior (See our handout on 'Training Dogs – Head Halter Training' and 'Training Dogs – Learn to Earn and Predictable Rewards'). The use of training devices that choke or cause pain, such as pinch collars, may exacerbate aggression and increase anxiety rather than settling the dog and increasing owner control. What can be done if my dog refuses to obey my commands? It is essential that the owner avoid any confrontation or situation that might lead to injury or where the owner may not be able to safely gain control. It may be possible to set up situations and the environment so that the dog must comply. It is counter productive to "force" or confront your dog, as this could lead to resistance and aggression. Instead, in each situation evaluate whether or not compliance can be achieved. If not, do not proceed; instead, change the situation so that you can successfully get the outcome you desire. As mentioned, you can achieve more immediate control if the dog is fitted with a remote leash and head halter that can then be used to take the dog for walks and is left attached when the dog is indoors and the owner is at home (except for bedtime). Each time the dog is given a command that is not obeyed the leash and head halter can be used to get the desired response. Although the head halter and remote leash is an excellent means of ensuring success and physical control, you have not succeeded until the dog will respond to the verbal commands without the need for leash pulls. 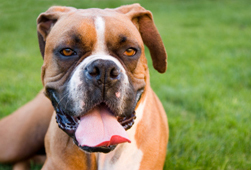 What is the prognosis for dogs that show aggression toward the family? outcome of a situation are rarely cured." Dogs that are willing to use aggression to change the outcome of a situation are rarely cured but often can be controlled. Improvement may occur by having predictable interactions, avoidance of aggression provoking stimuli, a good daily routine of exercise, play and social interaction. However, some dogs may continue to be aggressive toward family members and present a risk to those who live with them. Certain family situations may make it impossible to safely rehabilitate an aggressive dog and keep people from harm. Each case requires an assessment with a veterinary behaviorist and ongoing follow up to determine if progress is being made. Please see our other handouts on 'Aggression - Introduction to Aggressive Behavior' and 'Aggression in Dogs – Initial Safety'.